ozone layer protection from the U.S.
Sanden International pledges to play its part in preserving the earth's environment. 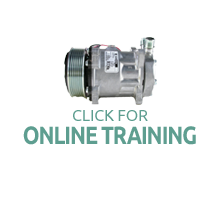 Sanden will strive to maintain and improve its environmental performance in the manufacturing of automobile air conditioning compressors through the control and minimization of it's environmental by-products and the review of environmental objectives and targets driven by environmental aspects. Sanden International (USA), Inc has achieved IS0 14001 certification. ISO 14001 is the internationally recognized standard for Environmental Management Systems. It provides guidance on how to manage the environmental aspects of our business more effectively, taking into consideration environmental protection, pollution prevention and socioeconomic needs. More than half a century has passed since Sanden was established. In our long history, we have entered challenging new areas of business and developed products that enhance the quality of life. We have earned a solid reputation as a leader in the field of technology development by providing products in anticipation of emerging needs, with a focus on maximizing social benefits and improving living standards. However, Sanden's efforts do not stop here. In accordance with our tradition of innovation, Sanden will develop products which meet the needs of users and make a valuable contribution to society. In particular, we continue to direct our efforts toward the development of environmentally sound products.